A chaplet is a string of beads used to keep count of prayers. The word is also used for the set of prayers counted on those beads. Thus one can "pray a chaplet" without having the beads themselves. Technically, the Rosary is a "chaplet," but typically, the word is used in Catholic circles to refer to prayers and beads other than those related to the Rosary. There are all sorts of various chaplets, and the sets of beads that often accompany them can consist of any number of beads, depending on number of prayers said. A St. Andrew's Christmas Novena chaplet set of beads, for example, will consist of fifteen beads since fifteen prayers are prayed each day from St. Andrew's Day to Christmas Eve. The Chaplet to St. Michael consists of a nine prayers -- one to each choir of angels. Therefore, a set of beads making up the St. Michael's chaplet will consist of nine groupings of beads, each offset by the single beads marking the Glory Be, Our Father, and Hail Mary. The chaplet called Rosary of the Seven Sorrows will have seven groupings of seven beads each. And so on. Sometimes a set of Rosary beads is used to keep count of prayers in other chaplets, such as the Divine Mercy Chaplet, in which the the "For the sake of His sorrowful Passion, have mercy on us and on the whole world" prayer replaces the Hail Marys, and the Eternal Father prayer replaces the the prayers said on the large beads when praying the Rosary. A chaplet's beads can be strung in a circle, as they are in the Rosary, or they might be simply strung in a straight line of chain or rope. They may have medals on them, or they might not have. They're almost as varied as Catholics themselves are, and they can easily be made at home out of any materials one likes -- even by simply making knots in a length of rope. Below is a small sampling of chaplets for you to consider. If you're attracted to a particular chaplet and want the beads to keep count of your prayers, make your own, or visit most any Catholic bookstore. Remember to begin and end prayer with the Sign of the Cross. The physical chaplet consists of 33 beads, one for each year of Our Lord's earthly life. On the medal or crucifix, make a spiritual communion by praying, "As I cannot now receive Thee, my Jesus, in Holy Communion, come, spiritually into my heart, and make it Thine own forever." On each of the 33 beads, pray, "Jesus in the Blessed Sacrament, have mercy on us! " The physical chaplet consists of nine sets of three beads, each set separated by a stand-alone bead. Like on a Rosary, a small line of beads and a medal hang off the circle. On the medal, pray "O God, come to my assistance! O Lord, make haste to help me! Glory be to the Father, and to the Son, and to the Holy Ghost, as it was in the beginning, is now and ever shall be, world without end. Amen." Pray one Our Father and three Hail Marys on the first four beads. First set: "By the intercession of St. Michael and the Celestial choir of Seraphim, may the Lord make us worthy to burn with the fire of perfect charity. Amen." Pray one Our Father and three Hail Marys. to leave the ways of wickedness and run in the paths of Christian perfection. Amen." Pray one Our Father and three Hail Marys. Third set: "By the intercession of St. Michael and the Celestial choir of Thrones, may the Lord infuse into our hearts a true and sincere spirit of humility. Amen." Pray one Our Father and three Hail Marys. and subdue our unruly passions. Amen." Pray one Our Father and three Hail Marys. Fifth set: "By the intercession of St. Michael and the Celestial choir of Virtues, may the Lord preserve us from evil, an suffer us not to fall into temptation. Amen." Pray one Our Father and three Hail Marys. against the snares and temptations of the devil. Amen." Pray one Our Father and three Hail Marys. Seventh set: "By the intercession of St. Michael and the Celestial choir of Principalities,may God fill our souls with a true spirit of obedience. Amen." Pray one Our Father and three Hail Marys. and in good works, in order that we gain the glory of Paradise. Amen." Pray one Our Father and three Hail Marys. in this mortal life and conducted hereafter to eternal glory. Amen." Pray one Our Father and three Hail Marys. End by saying four Our Fathers, one each for SS Michael, Raphael, and Gabriel, and for your Guardian Angel. Pray for us, O Glorious St. Michael, Prince of the Church of Jesus Christ. That we may be made worthy of His Promises. The physical chaplet consists of three sets of four beads in a circlet, separated by stand-alone beads. Hanging off of them are a single stand-alone bead and a Miraculous Medal. On each stand-alone bead, pray one Our Father, four Hail Marys, and one Glory Be. On each of the four beads making up the three sets of beads, pray ""Blessed be the Holy and Immaculate Conception of the Blessed Virgin Mary." This is prayed using a chaplet or rope with a certain number of knots or beads, typically 33, 50, 100, or 150 of them, usually with a marker bead or knot in between a certain number of them. In the East, the physical chaplet is made of rope and called a "chotki." Simply pray on each bead or knot, "Lord Jesus Christ, Son of the living God, have mercy on me, a sinner." This chaplet consists of four sets of ten beads in a circle -- representing the forty hours Christ spent in the tomb and in Hell -- with stand-alone beads in between each set. Hanging off of the circle is a Crucifix and five beads. Out of the depths I have cried to thee, O Lord: Lord, hear my voice. Let thy ears be attentive to the voice of my supplication. If thou, O Lord, wilt mark iniquities: Lord, who shall stand it. For with thee there is merciful forgiveness: and by reason of thy law, I have waited for thee, O Lord. My soul hath relied on his word: My soul hath hoped in the Lord. From the morning watch even until night, let Israel hope in the Lord. Because with the Lord there is mercy: and with him plentiful redemption. And he shall redeem Israel from all his iniquities. On each small bead: "Sweet Heart of Mary, be my salvation." Conclude each group of 10 beads with "Eternal rest grant unto him/her (them), O Lord; and let perpetual light shine upon him/her (them). May he/she (they) rest in peace. Amen." Conclude overall with, "Eternal rest grant unto him/her (them), O Lord; and let perpetual light shine upon him/her (them). May he/she (they) rest in peace. May the love of God and the peace of the Lord Jesus Christ bless us and console us and gently wipe every tear from our eyes. In the name of the Father, and of the Son, and of the Holy Ghost. Amen." This physical chaplet consists of a circle of seven sets of seven beads, one set for each of Mary's Seven Sorrows. In between each set is a separating bead. Hanging off this circle are three beads and a Crucifix or medal (sometimes the separating beads are medals which depict Mary's Sorrows). On the first three beads, pray a Hail Mary. On the separating beads (or medals), pray an Our Father. On each of the small beads, pray a Hail Mary. Lord Jesus, we now implore, both for the present and for the hour of our death, the intercession of the most Blessed Virgin Mary, Thy Mother, whose holy soul was pierced at the time of Thy Passion by a sword of grief. Grant us this favour, O Saviour of the world, Who livest and reignest with the Father and the Holy Spirit for ever and ever. Amen. This chaplet consists of five groups of five beads -- each group representing one of the Five Wounds. 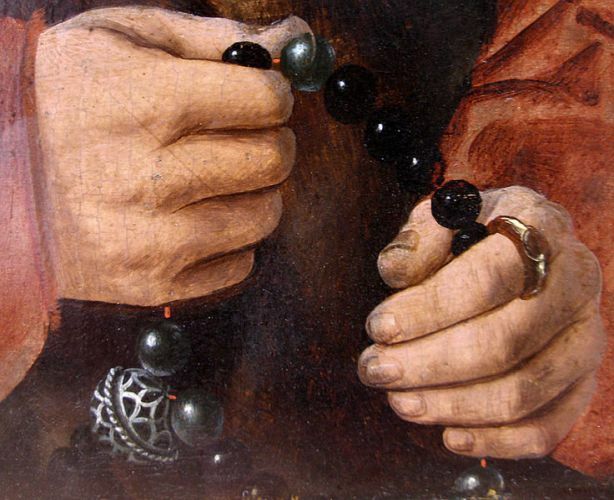 The first group of beads honors the Wound on His left foot; the second, the Wound on His right foot; the third, the Wound on His left Hand; the fourth, the wound on His right Hand; and the fifth, the Wound in His Side. Sometimes a medal will be attached depicting Our Lord's Wounds on one side, and His Sorrowful Mother on the other. This chaplet is prayed on the Dominican Rosary. On the Cross: Kiss the Cross, make the Sign of the Cross, say one Our Father, one Hail Mary, and the Apostles' Creed. On each large bead, pray: "Eternal Father, I offer Thee the Body and Blood, Soul and Divinity of Thy dearly beloved Son, Our Lord Jesus Christ, in atonement for our sins and for the sins of the whole world." O Blood and Water, which hast gushed forth from the Heart of Jesus as a Fount of Mercy for us, we trust in Thee.